This year was the Queen's diamond jubilee year; this meant that the government had declared that we could all have an extra bank holiday in celebration, which was conveniently tagged onto the Spring bank holiday thus resulting in a 4-day weekend. What more excuse did I need to go hill walking in Scotland for a few days!! I sought interest from various people and arranged to go away with Mark and Shona for the weekend. Due to the excellent weather forecast we settled on Skye, which I was very pleased with as I still had the northern half of the Cuillin Munros left to climb! 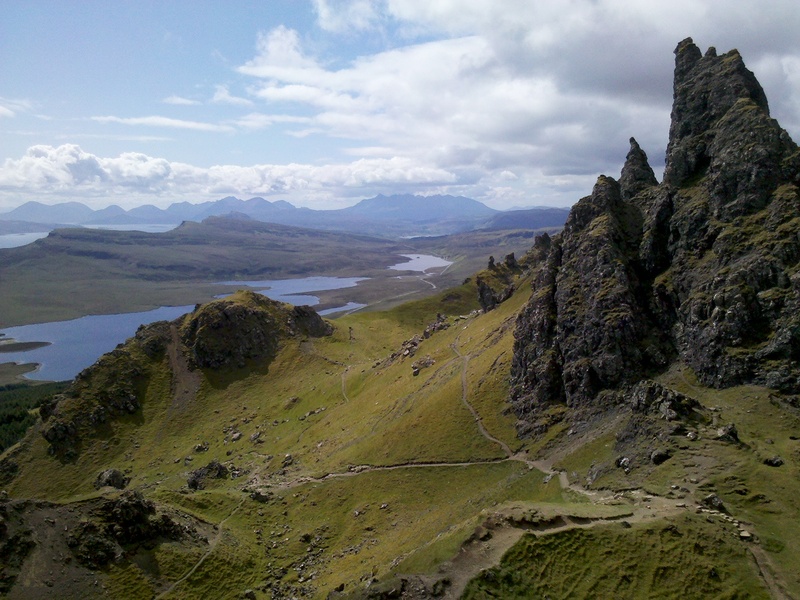 We had quite a varied trip with two days scrambling in the Cuillin and two days backpacking in Trotternish. Many thanks to Mark and Shona for such an excellent few days in the hills! The good weather helped too!! All in all in was an excellent trip and I am looking forward to returning to Skye at some point in the next few years as I still have Bla Bheinn to climb, which looks awesome!! Several weeks ago we had arranged to meet up with friends today for a pushchair / baby carrier walk, probably in the Peak. However looking at the weather forecast yesterday evening it looked increasingly likely that it was going to be a washout. Therefore Jim and I had a re-think yesterday evening and we decided to go to Kedleston Hall for the day as we knew that we would then have wet weather options should the pessimistic forecast turn out to be correct! We arrived at around 11:15am and walked the first section of the "Long Walk" before retracing our steps to the pleasure grounds where we had a picnic lunch. The grounds were indeed pleasant and we spent a while wandering around them, before a short stroll along the river followed by tea and cake. All in all it had been a nice day catching up with friends, and it was even sunny at times, with almost no rain! Gates at the start of the "Long Walk"
I slept soundly and was woken by Mark shouting across to me from his tent at 6:25am; somehow I had slept through my alarm! However I was soon up and enjoying the early morning sunshine, whilst packing up my tent. As Shona and Mark had been up since 6am, it was clear that they were going to be ready before me, so I suggested that they made a head start and I'd catch them up at some point. My rucksack was packed by 7:20am, and I was soon underway. The first climb of the day was only 30m up to the small hill of Druim na Coille. As per yesterday the views were excellent and they continued to improve as I made a steep ascent up towards our first major summit of their day. Eventually the ground eased and I found myself wandering alone across the moorland admiring the views, whilst being serenaded by countless birds - what a wonderful way to start the day! Soon I reached the summit of Biodhe Buidhe (Marilyn), perched above yet another precipice with fantastic views in all directions. I spied two figures heading for the road below and concluded that I had better get a move on if I was going to catch them up. I found them waiting for me on the edge of the bealach carpark, and waiting for me was a bacon roll that Shona had kindly bought from the hot food van. Clearly this carpark must get much busier later in the day in order to sustain the van, for at the moment we were its only customers! We followed the heavily eroded path up the steep slopes to the north before heading over to the edge of the escarpment to admire the fantastic views down to the weird rock architecture of the Quiraing. This is indeed a fascinating place, with a raised horizontal platform of grass called The Table at the centre of The Prison, which is the area enclosed by all the various towers and pinnacles. We briefly left the cliff top to nip over to the trig point and nearby summit rock of Meall na Suiramach (Marilyn, Highland Five), our final hill of the trip. 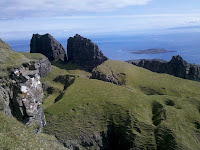 The air was again very clear so the views across to the Western Isles and south to the Cuillin and Rum were fantastic. There was some high cloud out to the east; perhaps a sign that a change in the weather was on the way? We returned to the cliff top and headed north along a clear path. Soon afterwards we took stock of the time and Mark decided to run ahead in at attempt to catch the bus! Shona and I continued walking northwards, before doubling back on ourselves at a stile and picking up a path that dropped down southwards below the cliffs. Here we began to meet a few more people as we admired the rocky towers from below, but unfortunately due to lack of time we were unable to scramble up into The Prison for a closer look; although we had already had excellent views of this area from above. After the last two excellent days of Munro bagging and scrambling in the Cuillin we decided it might be nice to actually go backpacking for a couple of days instead. Being on Skye already, a good choice seemed to be the Trotternish Traverse from The Storr to Quiraing with the aim of finishing late morning on Tuesday, so as to allow time for the drive home. A quick trip into Portree was needed to pick up the appropriate map after which we headed north on the coast road, with excellent views of the Old Man of Storr, to reach an extremely busy car park. We set off walking in the sunshine, up through the forest on a good path at around 10:30am feeling somewhat over-equipped compared to the majority of other people we passed! After a few hundred metres of ascent we reached the base of the impressive Old Man of Storr. I circumnavigated the pinnacle, whilst admiring the fantastic views in all directions. Soon we left the hoards and took a rightwards traversing path below the crags to reach the upper part of Coire Scamadal. A steep ascent up to the ridge lay before us, so after we had managed half of it we stopped for lunch out of the wind before continuing up to reach the trig point and nearby summit of The Storr (Graham, Marilyn) on a turf bank. The stone summit trig point looked to be in bad repair, with some bits missing, and likely to collapse at some point. There were a few other walkers up here, including sometime who had brought a radio aerial up here. We spent a while admiring the views and attempting to do self-timer photos of the three of us. The views were extensive across to the Cuillin, the Western Isles and over to the mainland. A descent over easy pathless ground brought us to Bealach a' Chuirn, and then after a couple of hundred metres of further advent we reached our second summit of the day: Hartaval (Graham, Marilyn) at around 2pm. Again the views were excellent as we attempted to identify the Fisherfield and Torridon hills. The next half kilometre of fairly level walking was a pleasant change, with much of the rest of the walk laid out in front of us, and out surprisingly wasn't actually that windy either. Soon we had to descend again, before the steep ascent up to Sgurr a' Mhalaidh and then the gentle ridge on to the summit of Baca Ruadh (HuMP, Graham Top). As it was now almost 4pm, and we still had quite a long way to go, we opted to skirt the next hill on its left to save a bit of time. Therefore our next hill was Creag a' Lain (HuMP, Highland Five), whose summit cairn we reached at around 5pm. A short descent, followed by an even shorter ascent lead to the unmarked summit of Flasvein (Highland Five). The crags to the east were now more broken as we made our way onwards to summit of Groba nan Each (Highland Five). It had now clouded over, but we had just two more hills left before our planned camp spot. Just under a hundred metres ascent northwards brought us to the summit of Beinn Mheadhonach (Highland Five) and then finally to our last summit of the day: Beinn Edra (HuMP, Graham Top). The concrete trig point was crowned by a small cairn and surrounded by a windshelter, suggesting that this hill was reasonably well walked although we had seen no one since The Storr. It was now 7pm, and the evening sun was producing a nice light on the hills to the south. We dropped off to the north west to reach Bealach Uige, where we found a pleasant grassy spot to camp almost on the edge of the escarpment with light breeze to keep the midges at bay. The sun was back out again now, as Mark and I went for a wander southwards to pick up some water from a pretty little stream complete with small waterfalls. Dinner was couscous, which we ate outside whilst enjoying the last of the sunlight. However soon we lost the sun and it became much colder, so we retired to our tents by around 10:30 just as the cloud was beginning to cover the top of the hills. I write this whilst supping a particularly appropriate ale considering the day's walking: Black Cuillin from the Isle of Skye Brewery, which just happens to also be one of my favourite Scottish beers! After yesterday's late finish, as you might expect we weren't particularly swift at leaving the campsite this morning! However we still managed to drive round to Glen Brittle SYHA and set off walking shortly after 9am, after having bagged one of the last remaining parking spaces nearby. The sky was mainly overcast as we followed the good path along the south side of the Allt a'Choire Ghreadaidh, which here flows through an impressive gorge complete with many waterfalls. The path was busy this morning, presumably due to the settled weather, and we could pick out several groups ahead of us high up in the corrie. We continued, crossing and re-crossing the burn a couple of times to reach a point where the corrie split into two upper sections. The right-hand upper section of Coire a' Ghreadaidh was very impressive with bare rock as far as the eye could see! However our way lay onwards and upwards into the left hand section; this is named Coire An Dorus and is also an impressive corrie, in which quite a bit of thrift was growing. We now left the main route up through the corrie to An Dorus as we were planning on scrambling up the NW ridge of Sgurr a' Mhadaidh. There was a bit of a worn line zig-zagging up the scree slopes, which we followed before taking a route up through rock via some slanting ramps to emerge on the ridge. Upon looking at the ridge we decided that it would be sensible to get the rope out and move together up the exposed route. Mark set off first, with Shona in the middle of the rope and I brought up the rear. Our route up the crest of the ridge was excellent and had plenty of exposure, mainly on the Coir' a' Mhadaidh side. And as I was at the back of the rope, I had ample opportunity to admire the fantastic views from our situation, especially back down the ridge towards Sgurr Thuilm. Higher up the ground eased and after dispensing with the rope, we scrambled up to the summit of Sgurr a' Mhadaidh (Munro). It was now very definitely lunchtime, it being after 1pm, so we had our picnic by the spectacularly situated cairn whilst admiring the excellent views on the rest of the Cuillin. After feeling suitably re-fuelled we descended south, picking a route to the right of the crest down loose rock and scree slopes with good views towards our next objective of the day. Soon we approached An Dorus, the door, the notch in the ridge above Coire An Dorus that forms the easiest route up our first two Munros of the day. This required a few metres of tricky scrambling to down climb into the notch, where there appeared to be a bit of a traffic jam due to the busyness of the day! We scrambled out of An Dorus on the southern side by some more tricky moves to establish ourselves on the North-North-East ridge of Sgurr a' Ghreadaidh. We continued up the pleasant ridge and soon the sun showed itself :) After passing the large impressive rock known as "The Wart", we soon reached our second summit of the day: Sgurr a' Ghreadaidh (Munro, HuMP). The exposed summit was busy with another group, so we decided that it would be best to push on rather than trying to find space to safely stop for a break here. Therefore we continued south along the ridge with good views back towards the northern Cuillin. This section of ridge was quite exposed and tricky in places as we made our way toward the south top of Sgurr a' Ghreadaidh (Munro Top) and then on down the south ridge to reach reach a pleasant broad dip in the ridge, which even had some areas of grass! This was clearly a popular spot to bivy on the main ridge traverse as evidenced by the rudimentary stone circle shelters. We stopped here for a bite to eat whilst admiring the extensive views over to Bla Bheinn and Loch Coruisk, and beyond to the mainland. After suitable refreshment we began our ascent of Sgurr Thormaid. Apparently there are three teeth on the ridge, which can be avoided if necessary. However we only noticed two of them, which suggests that we actually scrambled over the first tooth! We scrambled on upwards and soon reached the summit of Sgurr Thormaid (Munro Top). We scrambled down the SW ridge of Sgurr Thormaid to reach Bealach Thormaid. From here our route onwards was easier than the ground we had covered in the last couple of hours, and after ascending scree slopes and easy scrambling we reached the summit of Sgurr na Banachdich (Munro, HuMP) at around quarter to five. The views from up here were superb in all directions, across to Rum and other islands as well as the rest of Skye itself. This peak was my final Munro on the main Cuillin ridge and we spent quite a while on the summit admiring the excellent views before beginning our descent via the western shoulder. We dropped down into Coir' an Eich where we picked up a vague path back down to the Allt a' Choire Ghreadaidh and thence back to the car, where we arrived at around 7pm. It had been another excellent day out on the Cuillin ridge and after dinner on the Sligachan campsite we headed over to the pub for some celebratory ales and whisky. Around sunset I went outside to capture the following shot of the Red Hills at dusk, before returning inside to finish my whisky and then retiring to the campsite for the night. I met Mark and Shona at Leeds train station around 4:45pm yesterday afternoon and, after a quick visit to Mark's nearby flat, we were soon on our way north. Our plans were somewhat fluid in that all we had really agreed thus far was that we were going Munro bagging and possibly backpacking somewhere in Scotland! Although to be fair we had come up with three possible plans: a backpack from Strathcarron to Cannich, a backpack in the Cairngorms or a traverse of the Cuillin ridge. During the drive north we decided that given that the weather forecast was excellent for northern Scotland, we would head to Skye. The only problem was we weren't too certain whether we were ready for a full traverse of the main ridge as Mark was the only one of the three of us to have done much scrambling or climbing recently! Also it was clear that we wouldn't be able to get the required early start today, owing to the fact that Skye is a heck of a long way away! Therefore we agreed on a day walk / scramble around the northern Cuillin peaks. After much driving we decided to pitch the tents for the night above the shore of Loch Duich at around 1:30am! We were up again around 6 hours later and enjoying the fantastic views under cloudless blue skies, including along the Loch to Eilean Donan Castle around half a kilometre or so away. The sun beat down from the near cloudless skies as we followed the good path alongside the Allt Dearg Mór, complete with several small waterfalls and plunge pools that looked inviting on such a fine day! We continued SW alongside the burn until we forked left, towards Fionn Choire, around a kilometre before the Bealach a' Mhaim. A clear path (for now) continued upward, gradually gaining height whilst the scenery changed from the grass and heather moorland of the lower slopes towards the harsh bare rock of the upper corrie. By now we were no longer sheltered from the wind, which was proving to be quite bitter at times! In the upper corrie we stopped in a relatively sheltered area for lunch whilst admiring the excellent views back towards Sligachan. After feeling suitably rested we picked our way up the upper corrie, no longer on a clear path owing to the rocky terrain; however in the clear visibility it was relatively easy to pick out an obvious line up to the main ridge. Upon reaching the crest of the main ridge we stopped for a while to admire the outstanding views of the rest of the Cuillin before heading up the east ridge of our first hill of the day. After ascending this relatively easy ridge we reached the trig point and summit cairn on Bruach na Frithe (Munro, HuMP) at around 2:15pm. This was my 213th Munro, which therefore meant that I was now three-quarters of the way through! On previous significant Munro summits for me I have generally tried to have a wee dram; however given the serious nature of the terrain I decided that this was probably not such a good idea today (and I had forgotten to bring any whisky with me anyway!) - I would just have to have some in the pub tonight instead. After admiring the fantastic views from the summit we retraced our steps back down the east ridge to the bealach. Here we donned our helmets before scrambling up the west ridge of Sgurr a' Fionn Choire (Munro Top), from whose summit we had good views of the Bhasteir Tooth, Am Basteir and the rest of today's traverse. We decided that given the time we would give the Bhasteir Tooth a miss and instead ascend Am Basteir via its east ridge. Therefore after we descended from Sgurr a' Fionn Choire we descended scree slopes to the north of Am Basteir; these slopes were shaded and hence quite cold. Whilst the descent down the scree wasn't too bad, the ascent up to the Bealach a' Bhasteir was unpleasant due to the loose scree! From the bealach we ascended the east ridge of Am Basteir and soon reached the bad step. We had originally intended to take the left-hand variation and hence avoid the bad step but the route didn't seem to be entirely clear to us. Therefore as we had a rope with us we thought we might as well go an take a look at the bad step, especially as a group we passed descending said it wasn't too bad. After a relatively narrow section of ridge there was an abrupt drop, which looked tricky to descend. Therefore we got the rope out and I descended first on small holds, which were often hidden from above. Shona and Mark then followed and we left the rope in place for our return. Soon afterwards we reached the spectacularly situated summit of Am Basteir (Munro). We retraced our steps back to the bad step, which seemed significantly easier in ascent, before continuing our descent down to the Bealach a' Bhasteir. By now it was late afternoon (around 5pm) and we still had one more summit left to climb; however we still had plenty of daylight and food left so we pressed on towards the west ridge of Sgurr nan Gillean. We got the rope out and moved together up towards the ridge and then on up the Tooth Arete, which was pretty exposed in places with steep drops especially on the Lota Corrie side. Soon we reached easier ground and I scrambled on ahead to reach the summit of Sgurr nan Gillean (Munro, Marilyn) at around 6pm and was soon joined by the others. The views from this final Munro of the Cuillin ridge were excellent, especially in the evening light and we were joined on the small summit platform by two climbers who had just finished a couple traverse of the ridge. The easiest descent from here lay down the Grade 3 scramble of the South-East ridge, which was our planned onward route. Therefore after much admiring of the views, we began delicately making our way down the ridge. As we descended the ground eased and we came across a rather unusual sight: a small paper mache model of spaceman that a photographer carried up to photograph in the barren terrain! Eventually we reached a point on the ridge where we could pick our way down the slopes to the north east, following the reasonably obvious line down the scree to reach the path in Coire Riabhach, which we then followed northwards with excellent views of the surrounding hills in the evening light.